I enjoy going to garage sales in the summer, and when I saw two sales happening just a couple blocks from home, I convinced my daughter to walk over with me. We left the first sale with money in our pockets and empty hands. At the second sale, I walked around a table with an abundance of china and crystal dishes, and knick-knacks, which I admired and left on the table. But then I spotted, covered in dust and grime, a tea cart. 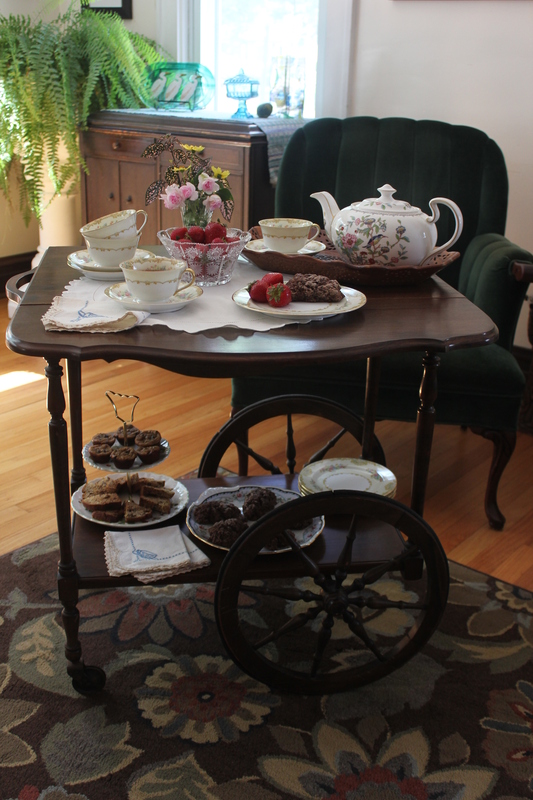 A traditional tea cart with beautifully spoked wheels and and drop leaves and everything. “It’s just like Hattie’s!” I squealed. Minutes later, we were rolling a tea cart down the bumpy sidewalk, with our other purchases precariously piled on top. Not quite the spectacle of Hattie and Teddy hauling an upside-down desk to the Soldiers’ Home through the busy streets of Milwaukee, but a sight nonetheless. After a thorough cleaning with Murphy’s Oil Soap and elbow grease, I found a spot for it in the living room. And the next day, I rolled it across the room, with faint clinking of my grandmother’s china, laden with chocolate zucchini scones and mini-muffins, strawberries, and tea. I imagined how many other times it may have been used, for women’s meetings or neighborhood card parties, holiday gatherings and family parties. And I look forward to making our own memories with it. What does this have to to with Teacher Resources? That’s what else happened this summer. We added Teacher Resources for Hattie’s War to our Resource page. Spread the word–it would make a great classroom read. And if someone needs to borrow a tea cart for a visual aid–I just might be able to help. In Hattie’s War, Hattie and her family celebrate the war’s end with the rest of Milwaukee. Little did she know how quickly the joy would pass. The city was still decked out in red, white, and blue when the news came from Washington–President Lincoln had been shot and killed. Those who can remember President Kennedy’s assassination, or the days after 9/11, can imagine the grief and horror experienced by the people of Milwaukee when the news reached them on Saturday. In my last post, I mentioned that Colonel Buttrick had been put in charge of the celebration parade for the city. Here’s the rest of the story. “The celebration of the nation’s victories, fixed for the 20th, is abandoned, and in its stead the people are called upon to pay tribute of respect to the memory of our chief magistrate, whose tragic death has filled us with horror, and whose loss to the nation has bound us together with the bonds of a common sorrow. The funeral ceremonies, consisting of a procession and orations, will take place on the day of the funeral of President Lincoln to be announced hereafter. Meanwhile, all associations, societies and organizations in the city are requested to report as soon as practicable, to the undersigned that they may be assigned a place in the procession. We have called upon those who have been and still are in the service, to rejoice with us. We ask them now to unite with us in our public manifestation of respect to the memory of one whom a nation honors and whom history will make immortal. Details will be published hereafter. One hundred and fifty years ago today, General Robert E. Lee surrendered to General U.S. Grant, ending the Civil War. For Hattie Bigelow, and the people in the northern states, this was a joyous day. Most Americans, too young to remember the end of World War II, can probably not imagine what this meant to the people. To imagine what Hattie would have experienced, we went to the newspapers of the time. How exciting it must have been for Hattie and her classmates to be let out of school to join in the celebrations. After four long years of war and suffering, peace had come at last. Colonel Buttrick was put in charge of the more formal procession and celebration to come the following week–but that’s another story. 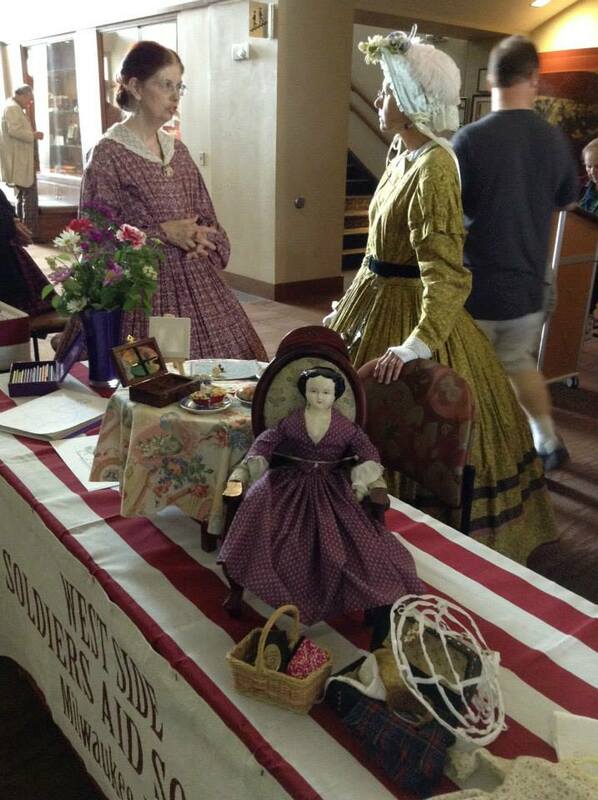 The Soldiers’ Home Fair of 1865 was the most significant fundraising event of Civil War Wisconsin. 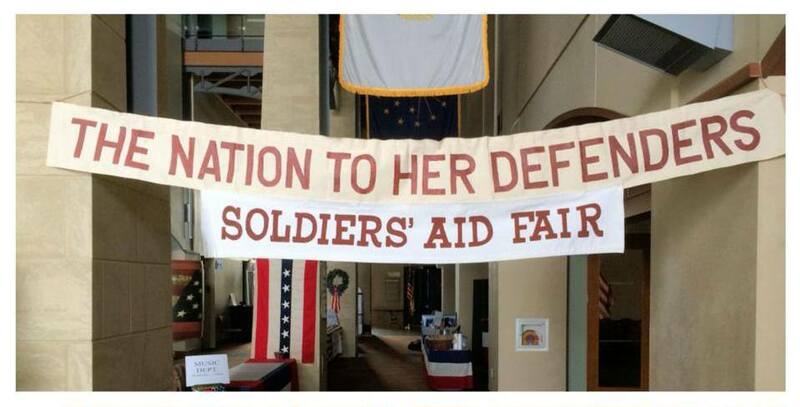 In this grand version of the popular soldiers’ aid fairs, Milwaukee women enlisted the help of communities statewide to raise over $100,000 to purchase land and build a permanent home for returning soldiers on property that still serves veterans today. In our forthcoming book Hattie’s War, Emily and I tell the story of eleven year-old Hattie Bigelow, a Milwaukee girl deeply involved in relief efforts, including the Soldiers’ Home Fair. 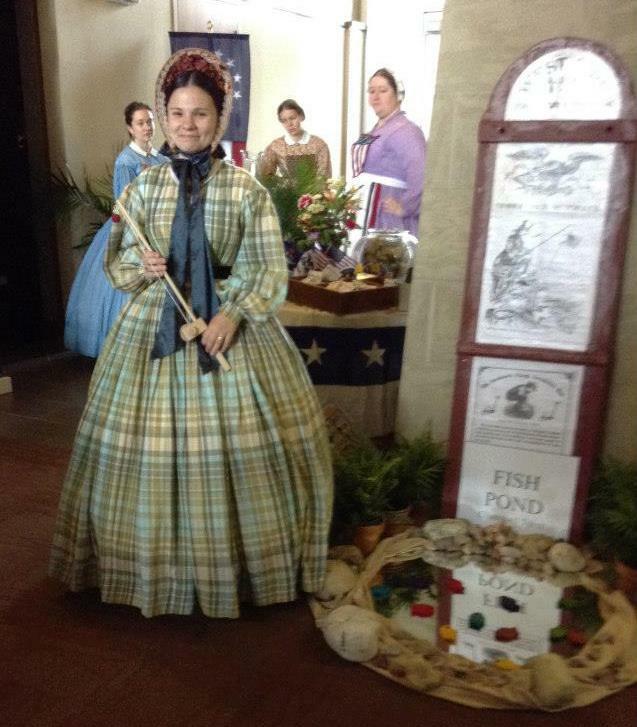 On June 21, 2014, the modern West Side Soldiers’ Aid Society of Milwaukee recreated the sights and sounds and smells of that fair, treating visitors to the Civil War Museum in Kenosha to a glimpse of Hattie’s world. 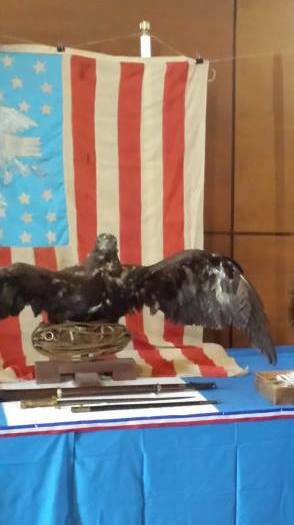 In the spirit of the dedicated nineteenth-century citizens who continued to support American soldiers after the war, the sponsors of this modern fair donated all proceeds to the Milwaukee Homeless Veterans Initiative. Emily and I are eager to share the rich heritage of Wisconsin’s Civil War history with readers of Hattie’s War this fall. Two days ago Emily and I realized that Plank Road Winter, our revision in progress, needed an entirely new chapter. The next day I plotted scenes in my head while driving from Indiana to Wisconsin. 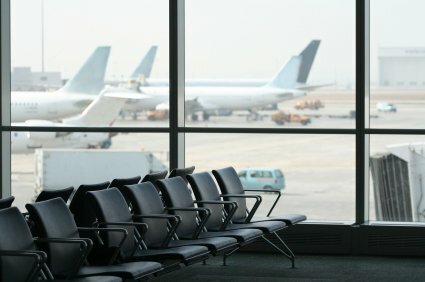 The following morning at the Milwaukee airport I filled twenty pages in the little spiral notebook I carry in my purse. Aboard a flight to Minneapolis, I typed those pages into my Netbook. I spent the afternoon in the Augsburg College library alternately scribbling in the spiral and typing from the handwritten draft. Early in the evening I typed the final lines of Chapter 27, emailed the manuscript to my sister author, and headed off to see the campus show that was my purpose for the trip. Ending a long session of writing fiction is like coming up from underground, blinking and a bit dazed by the strange world of colors and light. It’s nearly the same feeling as closing a book after a long stretch of reading. One emerges groggy and disoriented from traveling between worlds. 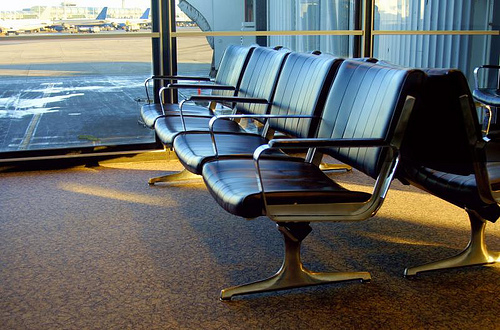 I write this post aboard a flight from Minneapolis to Milwaukee—though I have not yet arrived in Milwaukee, as the plane has been diverted to Madison, Wisconsin, because of snow. Does this mean I’ll have an opportunity to sit in an airport and edit a few more chapters of Plank Road Winter? A writer can always make use of an unexpected gift of time.